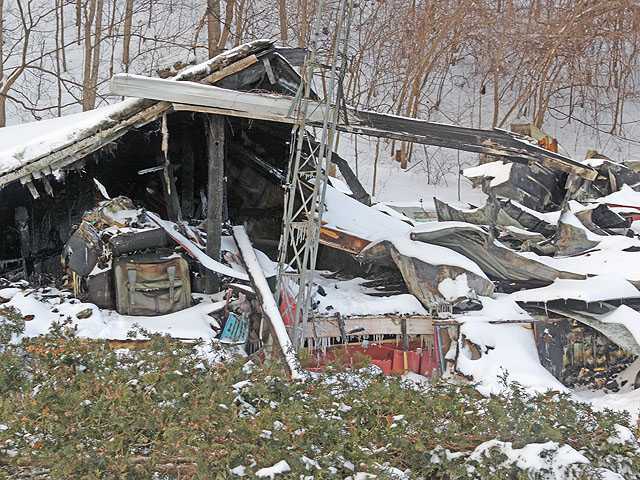 Snow has begun to cover what remains of the home on Kress Lane where a person died Jan. 26. POSTED January 29, 2019 9:31 p.m.
Two people died in house fires in Southwest Wisconsin in the past week. Five area fire departments battled a house fire on Kress Lane west of Dickeyville Saturday around 9:10 a.m. According to the Grant County Sheriff’s Office, after the fire was contained a first responder discovered a body inside the house. The Sheriff’s Office has not released the name of the person until an autopsy is completed and the person is identified. The Sheriff’s Office said the fire started from a wood stove inside the house. Dickeyville/Paris, Jamestown, Cuba City, Potosi and Lancaster fire departments fought the fire. Two days earlier, an 89-year-old man died in a house fire on South Lake Road in the Town of Fayette. The fire was reported Thursday around 11:45 a.m. A caller to Lafayette County 911 reported that the first floor of the house appeared to be fully engulfed and a person was believed to be still inside the house. The body of Melvin Leroy Narveson was found inside the house when the fire was extinguished, according to a Lafayette County Sheriff’s Office news release. Narveson was the only person inside the house. The Lafayette County Coroner’s office reported Narveson died from smoke inhalation as a result of exposure to fire. Argyle, Blanchardville and Darlington firefighters fought the fire. The Sheriff’s Office said the cause of the fire is undetermined because of the extent of damage to the house, but the fire is not considered to be suspicious in nature. The Argyle Fire Department, state Department of Justice Division of Criminal Investigation state fire marshal’s office and the Sheriff’s Office are investigating.